It's not surprising to learn that the symptoms of lung cancer in men can differ from symptoms of lung cancer in women. Just as men often have different symptoms than women when it comes to heart disease, they often have symptoms that differ from women with lung cancer as well. Whether is is symptoms in men or symptoms in women, we're learning that the majority of people are not familiar with the most common symptoms of lung cancer. That's of even more concern considering that lung cancer is the leading cause of cancer-related deaths in men. And you still need to worry if you don't currently smoke. In fact, the majority of people who develop lung cancer today do not smoke. They are either former smokers or never smokers. We know that lung cancer is more treatable in the early stages of the disease, but unfortunately at least half of people are diagnosed when they already have advanced lung cancer. Lung cancer is often first misdiagnosed as something else, and the average time between the onset of symptoms and the time of diagnosis is over one year. Yet there is hope. Everyone should become familiar with the symptoms of lung cancer. In addition, it's important to learn whether you are a candidate for lung cancer screening as well. One reason why symptoms of lung cancer differ between men and women is that the most common types of lung cancer are different in men and women—and different types of lung cancer tend to have different symptoms. Another reason for the difference is that a higher percentage of men who develop lung cancer have smoked in the past, and some types of lung cancer are linked more strongly with smoking. Certain symptoms are associated with lung cancer types. In contrast, the most common type of lung cancer in women is adenocarcinoma. Lung adenocarcinomas tend to grow in the outer regions of the lungs. These tumors can grow quite large or spread before they cause any symptoms. Initial symptoms may include shortness of breath with activity, fatigue, and back and shoulder pain rather than typical symptoms, such as coughing. The vast majority of small cell lung cancers are related to smoking, and small cell lung cancers occur more often in men than in women. Unlike non-small cell lung cancers (which are more common in women), symptoms are often present for only a short time before a diagnosis is made. Small cell lung cancers usually begin near the large airways and spread early, often to the brain. It’s not uncommon for the first symptoms of small cell lung cancer to be related to brain metastases, and these may include headaches, changes in vision, weakness on one side of the body, or changes in behavior. As noted above, the most common types of lung cancer in men tend to grow near the central airways. These tumors often cause symptoms earlier in the course of the disease, with symptoms related to the presence of the tumor near the airway. 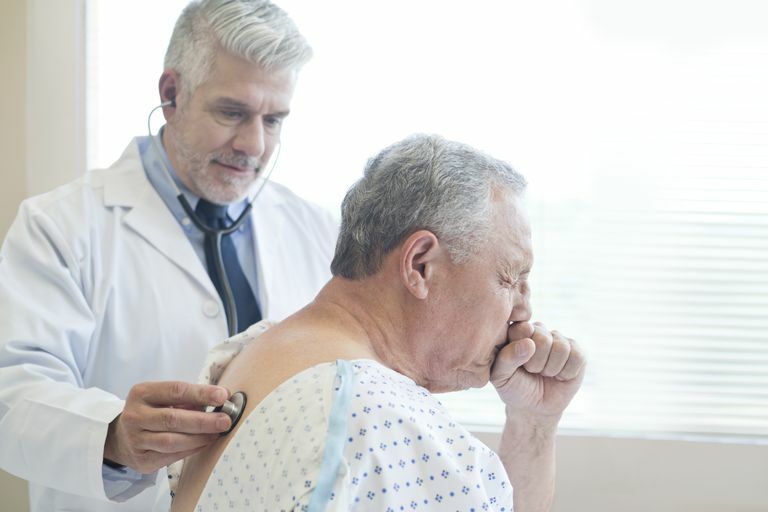 As such, coughing up blood, obstruction leading to lung collapse (atelectasis), and coughing might be seen earlier in lung cancers found in men than they would be in women. Another group of symptoms that are seen occasionally with lung cancer is something called paraneoplastic syndrome. Paraneoplastic syndrome is a group of symptoms caused by hormone-like substances secreted by tumors and is seen most often with small cell lung cancers, squamous cell lung cancers, and large cell carcinomas—cancers that are found more often in men. Paraneoplastic symptoms may include an elevated calcium level in the blood (hypercalcemia), a low sodium level, weakness in the upper limbs, loss of coordination, and muscle cramps, among other symptoms. Harichand-Herdt, S. and S. Ramalingam. Gender-associated differences in lung cancer: clinical characteristics and treatment outcomes in women. Seminars in Oncology. 2009. 36(6):572-80. Olak, J., and Y. Colson. Gender differences in lung cancer: Have we really come a long way, baby?. Journal of Thoracic and Cardiovascular Surgery. 2004. 128:346-351.